Daisy's Beach at Sunrise, originally uploaded by Michael Mitchener. 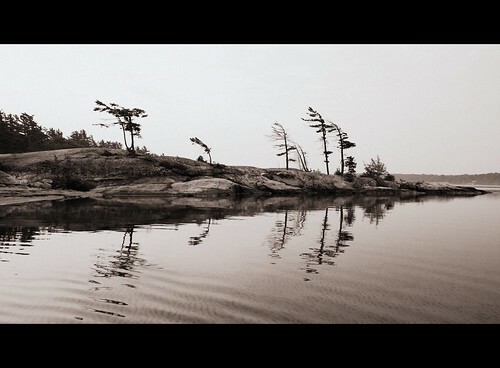 I waded across the bay to take this picture at sunrise when I was at Killbear Provincial Campground this summer. The alternative would be to take a path through the woods and I had visions of running across a bear while on my own (bear sightings aren't that unusual at Killbear although they generally keep their distance from humans). As it were, something that sounded "large" was moving through the trees towards the beach as I took this shot and I decided not to hang around to see if bears can swim. It was probably a noisy, fat chipmunk coming down to the beach for a drink although they can be fairly nasty as well. Loving Leuty, originally uploaded by Michael Mitchener. 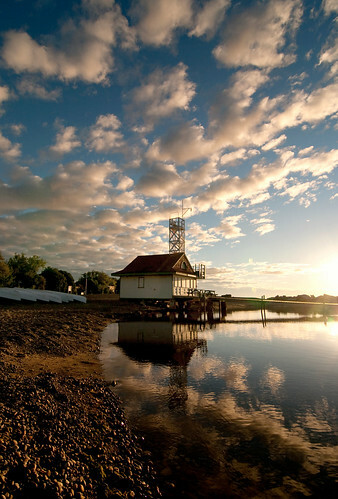 Sure it can be a bit of a cliché, but I never get tired of looking at Leuty Lifeguard Station. It helps to be 15 minutes early for your chiropractor appointment and have some time to kill as well. Are You Experienced, originally uploaded by Michael Mitchener. 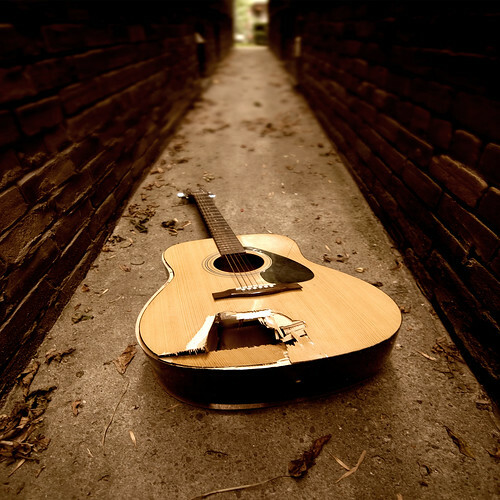 My neighbour told me that he was practicing his Jimi Hendrix impression and smashed his guitar. He also mentioned that it was fatally flawed before the incident so the guitar's days were numbered. I told him I might try a couple photos and he said I should go for it and that I had a few days as Garbage Day wasn't until Tuesday. This is my first shot although I might try some other variations before Tuesday. words+pictures, originally uploaded by Michael Mitchener. A while back, I submitted an Art Exhibits application to the Toronto Public Library and was accepted to display photographs at the Leaside Branch for the month of September. I've always been a library freak. As a kid, it was a magical place to spend time and throughout my adult life I've always held and used a library card. These days, I try to get down to the local Beaches branch once a week to borrow books, CDs, DVDs and/or magazines. In case you didn't know, the Toronto Public Library is the largest public library system in North America with over 11,000,000 items in its collection. I feel fortunate to have access to this well managed system and I'm pleased to be exhibiting at the Leaside Branch. All images in the exhibit are available for sale as displayed which includes a professionally printed 11" x 14" matte-finished, signed photograph with white mat in a 16" x 20" black gallery frame for $120. Please visit my GALLERY COLLECTION for a complete selection of photographs available and contact me if you would like to purchase a print. I'm happy to provide pricing for additional sizes or formats as well. 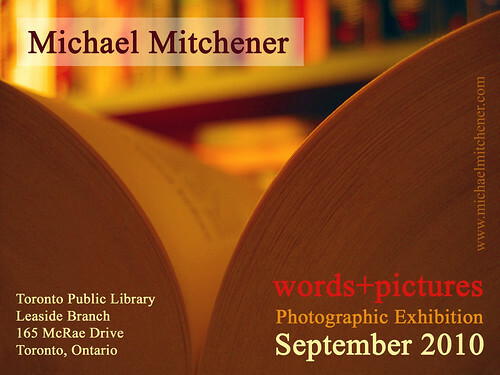 Join me between the stacks from September 4th to the 30th for words+pictures, a collection of never before exhibited images and a few previously exhibited favourites. The library will provide the words and I'll provide the pictures.